My recommender said he/she did not receive a recommendation email. If you think you have submitted your recommendation request successfully but your recommender has not yet received the email, please follow these steps. It is possible you just saved your recommender data but did not send it off. In order to verify this, return to the main menu of your application form and click Add or Edit Recommendations. Scroll to the recommender in question and check the Status field. 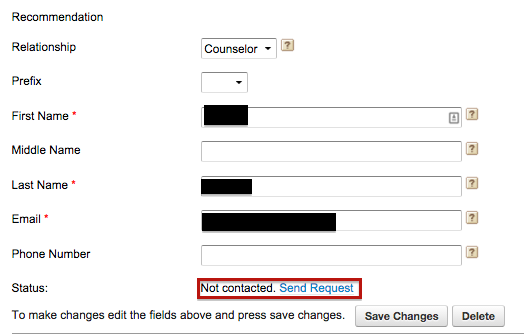 If it says Not Contacted, you will need to click Send Request. Make sure you spelled the email address correctly, and check with your recommender that this is the preferred email and the inbox that he/she is checking. If the email address is incorrect, you can edit it by returning to your application's main menu and clicking Add or Edit Recommendation Requests. 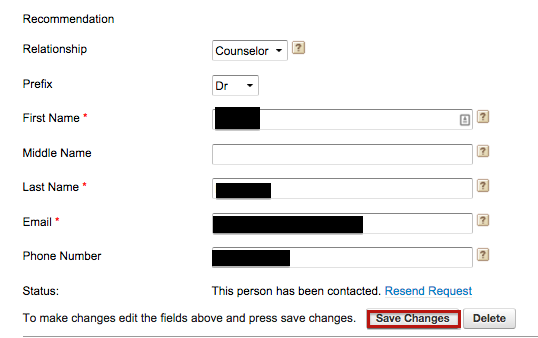 Edit the address in the email field and click Save Changes. If the inbox/email is correct, ask your recommender to check his/her spam folder. You have the option of sending the request again. In order to do this, return to your application's main menu and click Add or Edit Recommendation Requests. 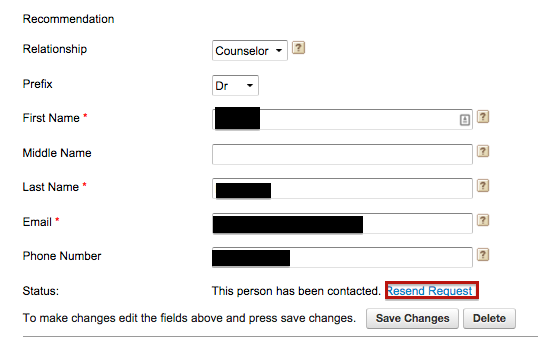 Locate the recommender in question, and click Resend Request.